I should just make a “most-wanted” poster for the beetles that invade my garden (and probably yours). When it comes to squash, you just need to look for the usual suspects — squash bugs, squash vine borers and cucumber beetles. The easiest way to protect your squash from these marauders is to put row covers over the transplants as soon as you put them in the ground and keep them there until the plants begin to flower. The bigger and healthier you can make your plants, the better the chance they will survive being attacked. If these marauders do show up in your garden, I use all the other organic methods you use for other garden residents including, picking, drowning and squashing! As with other insect pests, the first line of defense is to find the eggs and squash them. It is much, much easier to limit the invasion. Limit is the right word because no matter how hard I try, by the end of the growing season, there are always a lot more of them than there are of me. But because my garden is weedless, I can spend all the time normally spent dueling with weeds to find and kill insect pests! So every morning and every afternoon, I spend about 30 minutes in the garden…just hunting bugs. Undersides of leaves are prime egg-laying real estate. Squash leaves are broad and numerous so I systematically turn over each leaf, check it, crush what I find and move to the next. Some might think this is tedious but I actually find it relaxing. By the way, if you see frass around the base of your vines — yellow, moist, piles of chewed stem – you’ve got squash vine borers. Squash vine borers dig into the stems of your plants and kill them from the inside out. Try to get the eggs of these pests, too. But if you miss them, you can slit open the stem, near the frass, and find the little worm that is boring into your plant. Once you find and kill the worm, just pile soil on top of the slit in the stem of the plant. The squash plant should make a full recovery and you will keep other insect pests from invading the stem of the injured plant. I will answer with a question or two of my own. First of all, what could be nicer? I’m in fresh air, surrounded by life, listening to the song of the birds and enjoying the company of my West Highland terriers and their new buddy, a rescued Jack Russell terrier. Even killing bugs in the garden gives me moments away from the grind. With my bare feet planted firmly on the soil, the garden is the place I feel most grounded, literally. Secondly, why would you trust your health to someone else’s garden? Growing your own, practicing organic techniques ensures that your family and you will be eating healthy — you will be controlling what they eat! So you can look at bug control as a chore or you can look at it as an excuse to feel the sun on your face and to experience the sweet song of nature in your hands, your feet and your heart. 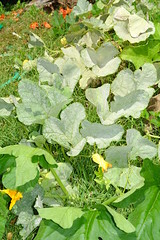 Powdery mildew is a scourge of cucurbits of any kind. But it’s a late summer disease that can be controlled by proper planting and, if your plants do get it, by using an every day, household staple. 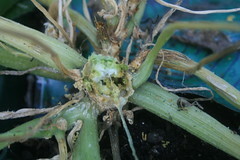 You can’t miss powdery mildew when it settles in on your zucchini. at powdery mildew. It’s a fast-moving disease but there is an easy, cheap and organic way to get control it and maybe even get rid of it. Mix 1 part milk – that’s right regular, old whole milk – and 9 parts water. Spray the affected plants. It’s easy, fast and cheap and backed by science. This backyard gardening technique was developed specifically for zucchini by a Brazilian scientist named Wagner Bettiol, the brains behind this “solution”. Bettiol’s research triggered an organic gardener and vintner, David Bruer to try the milk mixture on his vineyards. And guess what? It worked there, too! So, even though this is a very dilute solution made with a very common ingredient, it is effective and it’s non-toxic. Spraying in full sun works the best. Spray once a week but don’t spray more often than that because it can cause another kind of mold to grow on your plants. Try to start spraying as soon as you even suspect that powdery mildew is invading your space. And if you want to try to prevent powdery mildew from ever getting started, spray your plants before you see it and keep spraying every week or so. By the way, most of the advice for growing summer squash applies to its cousin, winter squash. I just don’t usually raise the winter ones because I don’t have the room for both. Squash are a bit like eggplant in that they are tough to pull off the plant with your hands. In fact, you’ll damage the plant if you try to pull them off and you’ll open the door for the squash borer to head on into the vine. So use a knife to harvest your squash and cut about an inch from the top of the fruit. If your vines are happy, they should be producing enough squash for you to be harvesting twice a week. I pick squash small. Larger squash have more seeds, are stringier and don’t have that lovely, delicate taste that only a baby squash can bring to the frying pan or a salad. Wash the squash off when you bring them in and either serve them that day or store them in the fridge for a couple of days. If you are getting too many squash to eat or store, peel them, shred them, toss them in a freezer bag and freeze them for use during the winter. I love squash and use it fresh in everything from salads to stir fry to grilled vegetables. I also shred it and freeze it then add it to a whole host of dishes that I serve in the fall and winter. But one of my favorite ways to serve squash is marinated and grilled to a golden brown. Here are a couple of my favorite recipes for using fresh and frozen summer squash. Marinades are fast and easy and add just a touch of flavor to grilled veggies. This master marinade and the three variations are courtesy of Cook’s Illustrated Magazine. DIRECTIONS for all: Whisk ingredients together. Shredded zucchini and summer squash make absolutely wonderful additions to meat loaf, soup and breads. The squash is a great extender that adds flavor and moisture to all three without adding any calories or carbohydrates like bread crumbs so. But here’s my favorite way to use shredded, frozen squash – my Mom’s gingerbread. Sift dry ingredients together and put in mixer bowl. Add sugar and shortening or oil and mix then add eggs. Mix hot water with molasses then pour into mixing bowl. Add shredded zucchini or summer squash and mix in thoroughly. Bake in 8 or 9 inch pan(s) at 350º for about 45 minutes but make sure you check to keep it from over-baking. Serve warm or cold with whipped cream or plain. By the way, I think my second, favorite way to bring a bit of summer to my winter menu is to add shredded zucchini to your favorite meat loaf recipe. It extends the amount of meat loaf you make and makes the meat loaf juicier! Next week….some hard-earned lessons on growing potatoes. This entry was posted in Gardening Tips, Organic Gardening, Tools for the Organic Gardener and tagged cucumber beetles, organic gardening, powdery mildew, squash beetles, squash borer, summer squash. Bookmark the permalink. Thanks so much for letting me know! I love organic gardening but had no one to share my accumulated (and hard won) knowledge. That’s one reason I’m writing it all down. SO it is very gratifying to know that you and other subscribers are enjoying it. Please feel free to share your ideas and tips, too!